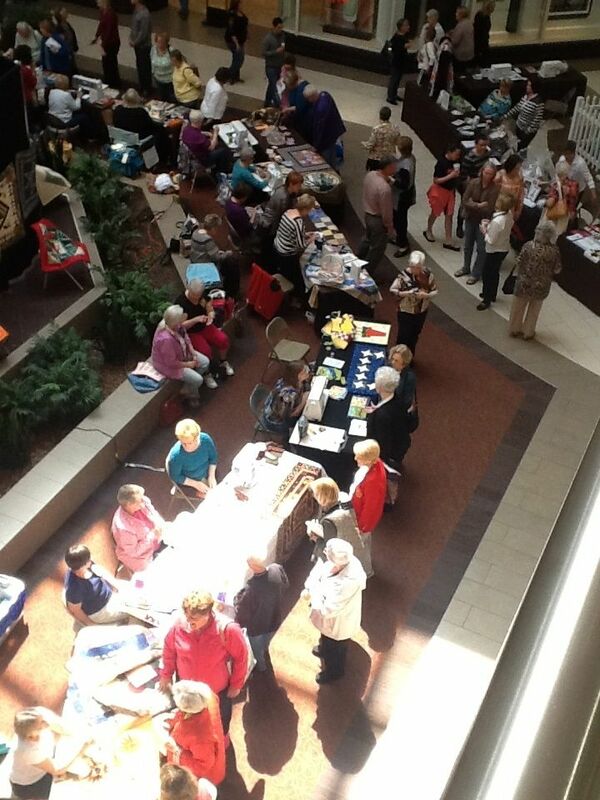 Chattanooga area quilters spent yesterday afternoon, Worldwide Quilting Day, together at the mall. Here I am (donning my light-up tiara) with fellow guild members from the Choo Choo Quilters. Cristy Clark, Sherry Baldwin, Veronica Hofman-Ortega, and Nancy Allen (seated). 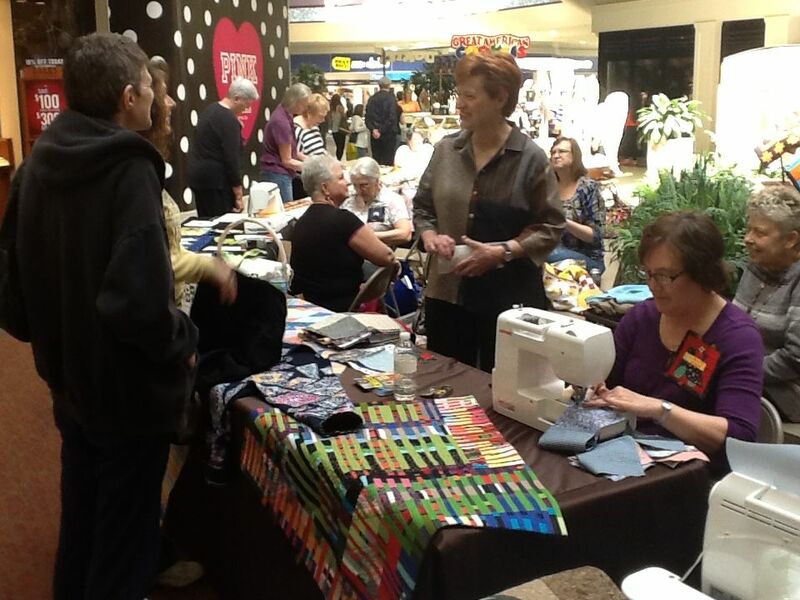 Stitch in the Mall was held at Hamilton Place Mall, and quilters and non-quilters alike came out for the event. View of tables from second floor. There were examples of projects and quilts the guild members created on the tables. Since the Choo Choo Quilters is such a diverse group, we covered all the bases with examples of our work—from traditional to contemporary. On display was Nancy's feathered star, art wear (an embellished sweatshirt), Sherry's hand embroidered Challenge quilt, examples of charity quilts, a demo on making a 4-patch, and "Marketplace," one of my improvisationally pieced quilts in a more contemporary style. This quilter asked about the quilt finishing on my improv piece. 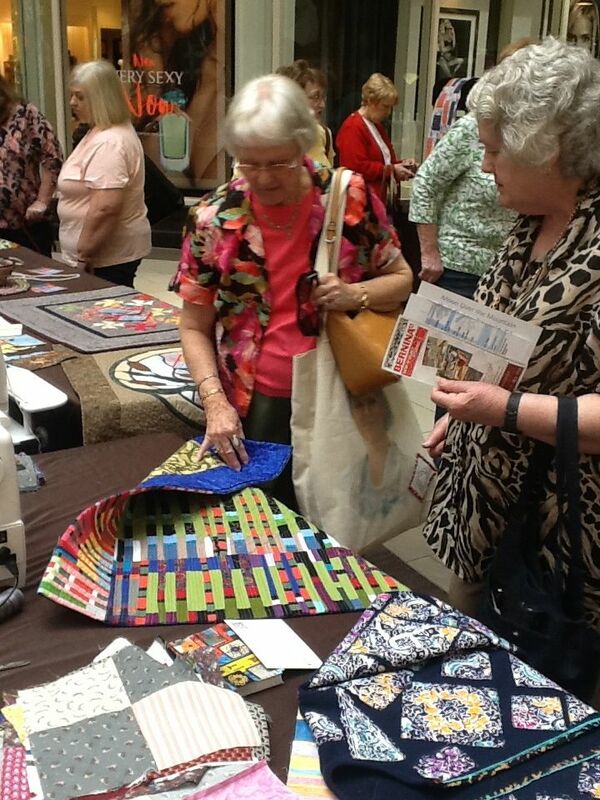 Visitors were impressed with the free-motion quilting. 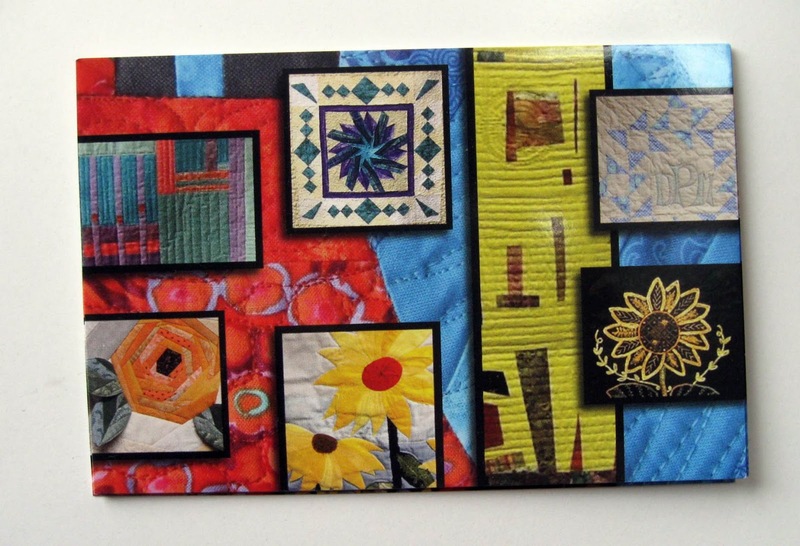 Guild postcard that I designed featuring 2014 Challenge quilts. Visitors asking questions at the guild table. 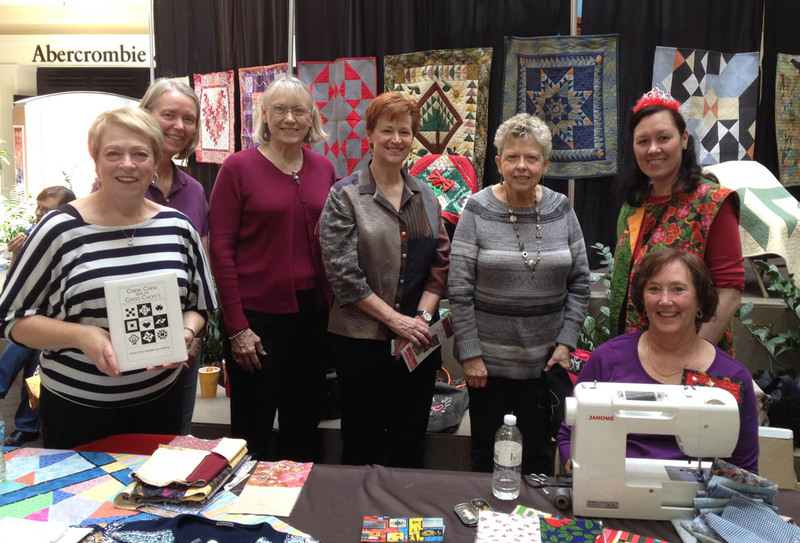 It was wonderful to see quilting friends from other guilds and several quilters who have taken classes with me. 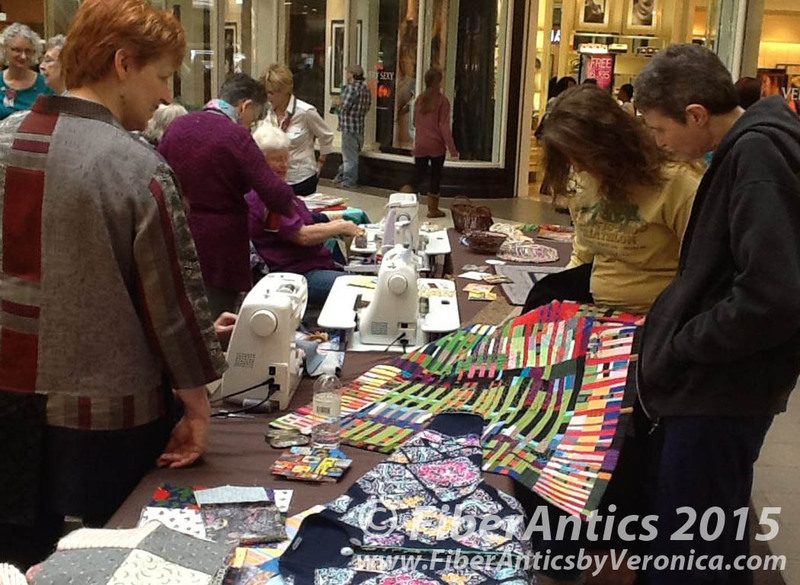 Celebrating Worldwide Quilting Day 2015 was a fun reunion.